Hello everyone! 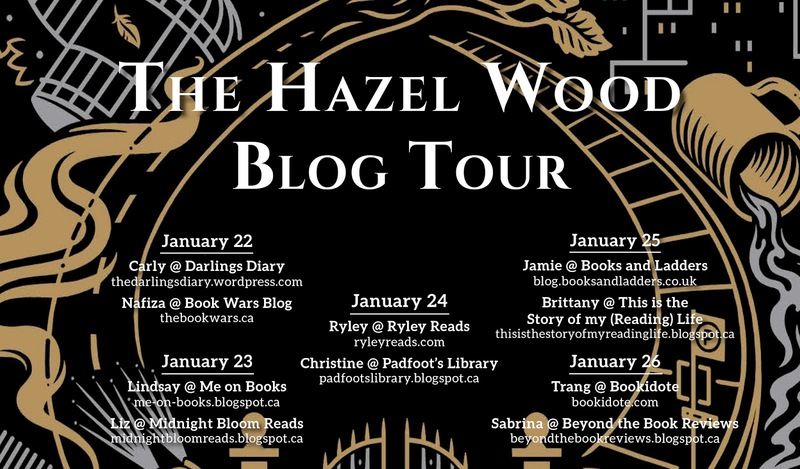 Today is my stop on The Hazel Wood blog tour hosted by Raincoast Books. I will be reviewing this book, which reminded me of my childhood and my fairytale obsession. As well, us bloggers were given an opportunity to ask the author one question, so stay tuned to the end of the post to see what Melissa Albert's answer was to my question. 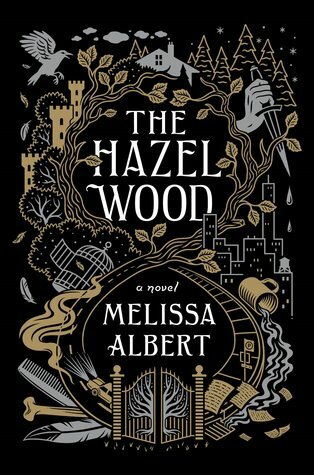 The Hazel Wood by Melissa Albert was not exactly what I was expecting it to be. I expected to see a lot more of the "Hinterland" tales (this is the story that Alice's grandmother wrote). In reality, we really were only exposed to I believe. However, It was recently released that there will be a second, so I do hope we get to experience the other stories. Though The Hazel Wood wasn't exactly what I was anticipating it still made for an interesting read that I ended up enjoying. 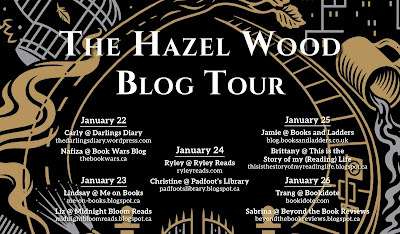 I enjoyed the world itself and how the hazel wood was actually incorporated into the story. To me, this aspect was one of my favourites. The haunting characters and scenes felt true to the nature of actual fairytales. In comparison, kind of like the original Grimm tales. It did read differently then any book I have read before, so adjusting to the style of writing did take a bit of brain power. However, once I was in, my mind was set on finishing the book. Overall, this book was unique in a way with incorporating some of the stories from "Hinterland", however, I do believe that this book may not be for everyone. It was slow paced at the beginning so that may affect the way some people read it. The book covers haunting and darker topics, but it does entice. I would recommend this book to those who enjoyed the original Grimm fairytales. I will be looking forward to reading book two. Sabrina: What was your favourite fairytale growing up and why? Melissa: Does Peter Pan count as a fairy tale? I think it does: there are certainly fairies in it, and a battle between good and evil, and magic I fell in love with as a kid and never recovered from. I love it because it’s beautiful and haunting and clever, with images I can recall with crystalline perfection in my mind’s eye: the mermaids’ lagoon, Peter’s hand messy with fairy dust, the heavy cake Captain Hook bakes in an effort to kill the Lost Boys with stomach cramps, the underground house where Wendy becomes the boys’ mother. There are very dark moments in it, too, that remind you Peter Pan isn’t a Disney character or a hero: he’s a selfish, arrogant, mesmerizing child who left an entire world behind just to avoid growing up. Do you want to read The Hazel Wood? What is your favourite fairytale or folktale? Everyone seems to have similar opinions on this one being not what they expected. I'm curious but I think I'll have to adjust my mindset before picking it up. Great review Sabrina!! Thanks for joining us on the blog tour Sabrina!